Form F-4 or the "Personnel Action Form" is a form issued by the Alaska Department of Public Safety. The form was last revised in June 1, 2017 and is available for digital filing. Download an up-to-date Form F-4 in PDF-format down below or look it up on the Alaska Department of Public Safety Forms website. 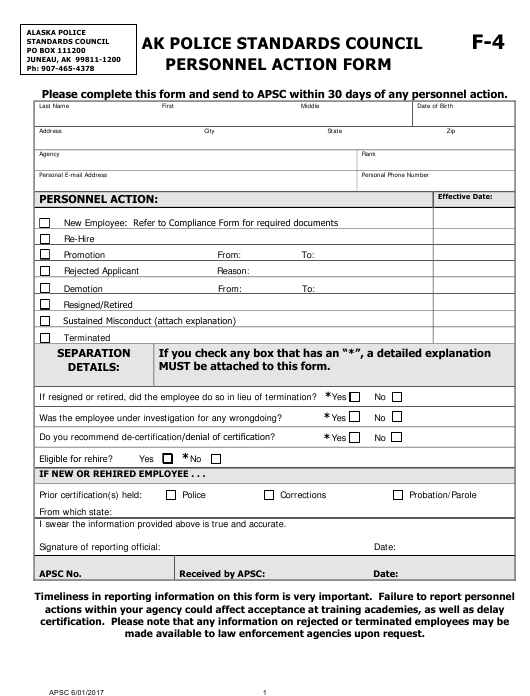 Please complete this form and send to APSC within 30 days of any personnel action. MUST be attached to this form. If resigned or retired, did the employee do so in lieu of termination? Was the employee under investigation for any wrongdoing? Do you recommend de-certification/denial of certification? IF NEW OR REHIRED EMPLOYEE . . . I swear the information provided above is true and accurate. made available to law enforcement agencies upon request. below or attach a separate sheet of paper.